Will this be the beginning of the end of breastfeeding? 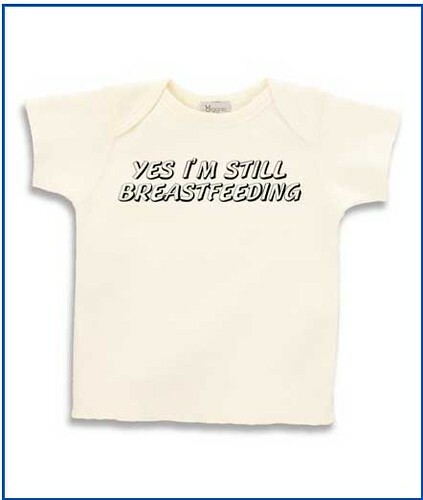 Yes I’m Still Breastfeeding Infant/Toddler Tee T-shirt, originally uploaded by Paper Mama. Ok, I’m going to get really personal here and vulnerable here, but I believe there are others out there who may feel similarly. Plus, maybe if I get it off my chest and on the screen I could better decide what to do and how to do it. And hey, maybe someone out there will hear me and maybe have some advice. But please, do be kind! I’ve read nasty discussions on this topic on other places and I’d really like to avoid that here. I still breastfeed the Sprout at almost age 2. The majority of people around me think this is absolutely ridiculous, and he should be over it by now. Less than a handful of people I know genuinely think it’s good to continue and it’s the best for him. Add to this all his issues with food – meaning he really isn’t keen on food in general and absolutely won’t have even a taste of some things – and people always blame the breastfeeding. The issue I’m struggling with here is really how do I feel about it in the middle of all this? I’m not quite sure. I always knew I wanted to breastfeed, despite all the struggles in the beginning, and all the advice for me to just give up and give formula, I was brave enough to say screw it and go with my gut. It was really hard to this the first 5 weeks, but then it was oh so perfect. However I never really thought for how long I’d want to breastfeed. While I was pregnant, and with all the information I read, I figured around 6 months. I figured that’s what they say you’re supposed to do, right? Then he was born, we struggled, I gathered information and then thought, well, at least a year. Then I read some more and figured he would breastfeed for as long as we were both happy (with the emphasis on his happiness though). Fast forward to now. Until very recently, he would have a feed before nap, before sleeping at night, during the night inconsistently and in the morning. But now Sprout is constantly asking to breastfeed, especially since he learned the word mek (milk). At any random time, sometimes right after he had a feed. On good days, I usually say yes whenever he wants to, at least I do if we’re home. On bad days, I really resent it and we both end up unhappy because he wants to feed and I try to put him off. I especially resent it when we’re out and he wants to feed anywhere in public. Now, I’m trying to figure out if I’m truly not happy with him breastfeeding, or if I feel this way because of what I think others are thinking. This really bothers me. I really shouldn’t care what others think – it should not be a factor. But at the same time, I kind of feel like I want my body back, like I’m ready for this phase to reach an end. Would it actually be better for Sprout? Would he eat/sleep better? Could I then have some more time to myself? There’s just no way of knowing the answer to that. What if I do wean him, and he has a hard time and I feel like I should have continued? Why is it so strange to breastfeed a toddler in our society. It used to be normal. What if the weaning process is traumatic for him? But then again, what if he never really wants to stop breastfeeding on his own (ok, maybe never is unrealistic… I doubt he’d be a breastfeeding teenager…)? There are just so many questions, but I keep thinking, if I’m not happy with him wanting to breastfeed ALL THE TIME, is it maybe really time to stop? Is it more harmful to him if he feels my resentfulness when I feed him? What would be the best way to start weaning. Then I think, the attachment parenting etc movements, which are very much in line with how I parent, would think I’m just awful for not following the child on this. Are they right? Is this just another form of peer pressure as well? Or would I be an awful parent if I imposed weaning, even partial weaning, on him? Well, no answers I guess, only questions. Let’s see. I may start weaning him, just keeping a couple of feeds. Maybe try to dissociate breastfeeding with sleeping – although it’s so much easier to breastfeed before putting him to sleep. He’s much calmer that way, but then he expects me to breastfeed every time he wakes up – which is A LOT – and I’m oh so tired from lack of sleep. I don’t know… At the same time it feels like it’s such a natural thing and make him oh so happy. You should be proud for your breastfeeding… And if you think it’s time to stop, you should do it. Start talking with Alex, explain that it’s time to some changes, and offer something else instead. Something he might enjoy eating… Even if it’s a chocolate or a candy… it won’t last forever… Eventually he won’t need it… I don’t know if breastfeed implies troubles with general food… Didn’t read anything about it… but kids aren’t all the same. Never had that kind of problem with Bea… But she was very regular… We kept on replacing breast for the other meals and not both…but then again, kids aren’t all the same…. And about the slipping time… Bea is almost 4 now and we still struggle with the nights. So I’m not sure breastfeeding is really related to that. This issue is bothering you so stop thinking about what others might say… first you should decide what to do, and next put it going… talk and talk with your kid. Try to explain him what’s going on. He will understand and it will be easier on both of you! I don’t know if he will eat/sleep better but you will get your body back, for sure… The independence is a good thing and it’s time you both enjoy it. Anyway this bit of freedom is really just a bit… he will need you the rest of his life ‘cause your his mom! But i really hear your concerns, i am still pregnant and am thinking about for how long to breast feed (if of course i can), you have given me alot to think about as i too have heard differing, logical arguments for breastfeeding over 2yrs and under 1yr. Whenever i am thinking over an important decision, i swim (used to jog) for ages being physical seems to help clarify my mind. Is there anything you can do that will give you that sense of stepping back out of the situation to view it from a distance. To take not only the facts that you have learnt,read, heard, but also the feelings and jnstincts. So that you can see each one with space around it, and not be overwhelmed/ flattened by them all. I wish i could send you a big burst of spring breeze to release the pressure a bit. But i shall send a good luck hug. Maybe writing it all down has helped, good idea! i do hope so. Gosto muito de ler os teus “posts” é uma forma de me manter (muito indirectamente, diga-se) em contacto contigo! Cada criança/bébé tem o seu ritmo, biotipo. Logo não se pode generalizar! Amamentei a Inês até aos 14 meses, sendo que até aos 6 meses nem água bebia, só leite materno, porque a disponibilidade era praticamente total e foi a minha decisão, apesar da familia ficar apavorada com o facto de eu não dar água à menina!!! Depois, a partir dos 14 meses começou a descobrir novas texturas de alimentos, papas, e naturalmente começou a pedir menos mama. Também ajudou o facto de ter iniciado a creche. depois, pura e simplesmente, deixamos de nos preocupar com essa responsabilidade: ela deixou de querer e eu deixei de “produzir”. Em relação ao André, tudo diferente. Quanto aos vínculos afectivos mãe-filho, não se duvida que eles saíam muito fortalecidos nesse período inicial pois nós somos o “Mundo ” deles. A nés até aos 5 -6 anos, se eu deixasse, ainda queria mamar…apenas pelo consolo que tinha de estar aninhada na mãe…não pelo leite de certeza!!! Portanto, e para terminar, que isto já vai longo, não stresses e deixa o menino seguir o ritmo dele, sendo certo que as qualidades que o leite materno lhe aporta são mais evidentes nos primeiros meses de vida. agora deixo-vos com um grande beijo de saudade e energia para a vossa vida! I hear you on this issue. I have two children and I only breastfed both till about 10 or 11 months, but only because it just felt natural to me and to them at that time. I never had a screaming situation from them when I stopped. They just started eating a lot of other food and drink formula, and so it felt that it was time to move away from breastfeeding. I also felt as if the kids were associating me only with breastfeeding. They did not really play with me, and if they were playing with daddy all happy and jolly I would enter the room and they would start screaming weather they were hungry or not because they wanted the breast. I know that there are a lot of criticism about breastfeeding the children when they are over one, but I think every family needs to do what is best for it. If you do not feel like it’s time to stop breastfeeding, then it isn’t. I had known people who breastfeed longer than one year of age who loved it and those who hated it. I felt bad for those who hated it because they were basically forced by their families or situations to continue breastfeeding. When you stop breastfeeding you need the support of your family and especially the husband, but if you do not get that, then it’s difficult to do it alone. Those people who loved breastfeeding said that everyone was pretty happy about it and that they are in no rush. So, I say do what you feel is right to do. If you and your boy feels good then continue breastfeeding. If you start to feel like you may need to stop, then start making conscious effort to do so. And don’t listen to criticism. People always find something to criticize about. And life is way to short to pay any attention to them. As always, your words bring tears to my eyes! I don’t know if it’s just the “saudades” or the way you always got me and supported me without judgement. I do wish we were closer! Thanks for all your suggestions. I actually just realised he was asking for milk so much again because his molars are coming in and he’s in pain! Anyway, I will try some of the things you said so he does’nt nurse so much (at times it’s really not convenient – or even possible really! ), but other things I don(t think would work – like chocalate or his favourite foods – he never has much and although he loves chocolate, he’ll only have a tiny bit at a time. I guess he just eats small portions! And I know about the sleep! One day it will be easier! I really did help to write it down. Thanks for the good luck hug, and all the best with your pregnancy! When are you due? Vanessa! Há quanto tempo! É tão bom ouvir de ti e saber como foi a tua experiência com os teus pequerruchos. Realmente cada criança é uma criança! E eu costumo seguir o ritmo dele também – eu sei que estes anos voam e em breve ele vai querer voar também. É tudo tão relativo! Ainda por cima, agora sei que ele pedia tanta mama porque tem dois dentes a romper que o deixaram de rastos este fim de semana. São tudo fases! E tu como estás de momento? Grande advogada e mamã! Aliás, grande mulher – sempre o foste! Grandes beijos de saudades para ti também!!! You are so right – life is too short to worry about what others think and someone will always find something to criticise! By the way – I just stopped off your blog for the first time. I know you had commented on another post some time back, but something happened and I never really got a chance to reply to you! Sorry! Great to hear about experiences from another expat mama. I’ll add your link to my blog if you don’t mind.